As many of you know, when I lived in Vegas I used to feed the homeless right off my back porch. I’ve started something similar here. My guests are truly a seedy lot. … except this fella who prefers to eat at the greasy spoon on the other end of the porch. He also seems to have some bird-brained notion he should eat upside down. Lucky birdies getting such an easy feed. KB — in Vegas it was vagrants & drunks. Here it is birds. I’m always feeding somebody! Cherie — and when they’ve been eating fermented berries they can be quite clumsy and hilarious. Such beautiful birds! Even more beautiful than the papaya eating (stealing) mynah and bulbul, that’s for sure. Kay — Amoeba and I were just discussing that at dinner! We never would have purchased food for those feather thieves. They ate my papaya, my Mountain Apples, my green peppers and my tomatoes. It’s fascinating to me that we have the same birds at our feeders, all the way over here on the East coast– the coloring is a little bit different, and we also get Cardinals, but the little birds are just the same! And of course, we have squirrels…although they haven’t quite figured how to swing under the eaves to get to the suet. Glad to hear the Amoeba is coming back to life after his jaunting around. That gets harder and harder on the body as we mature! Kelley — we don’t seem to have squirrels or chipmunks out here on the islands. I guess they can’t swim!? Amoeba slept most of yesterday and all night! He did wake long enough to eat lunch and dinner. Oops – forgot to say – gorgeous photos! Do you shoot through the window? Settings? Kelley — Some of these were shot through the window. For the Chickadee one I was outside. And I had the camera set on automatic-action. I can’t think as fast as the birds move. yeah, do you photograph through your windows without the flash on? If I so much as whip out my camera from my purse, the birds are GONE!!! Your shots are so cool! Gigi — I took the photo of the Chickadees from outside. The remainer were taken through the window. Note the slight haze over the first woodpecker photo. I forgot to turn the flash off. I went outside and sat very still in a chair on the patio and waited for the birds to return to the feeders so I didn’t have to open the door and frighten them. Even so I didn’t get many pics because I got cold, my arms got tired and on the 4th or 5th shot I forgot to suppress the flash and scared them all away. I love Downies and Chickadees — they’re so CUTE!!! `Karen — we agree. They are one of our primary sources of entertainment. Great photo captures! I need to get a basic bird book to identify our bird visitors.We do have some cardinals who visit regularly and a blue jay but we get a variety of smaller birds that I am not familiar with. We use Peterson’s Field Guide of Western Birds. Amoeba finds it very thorough and accurate. Of course, you probably want to find the one for your particular region. Quilly (and Barbara), there’s a great site that can help you narrow down the choices…if you don’t have someone like Amoeba around who can do that by looking at them! Thanks, Kelley — it is difficult to look up a bird if I don’t have Amoeba to start me off with a name. I like the way this works by looking up bill shape or body shape or size, etc. Excellent resource! Karen — thank you. Nobody else commented on the puns! What a great variety of birds there! And your photos are awesome…as usual. 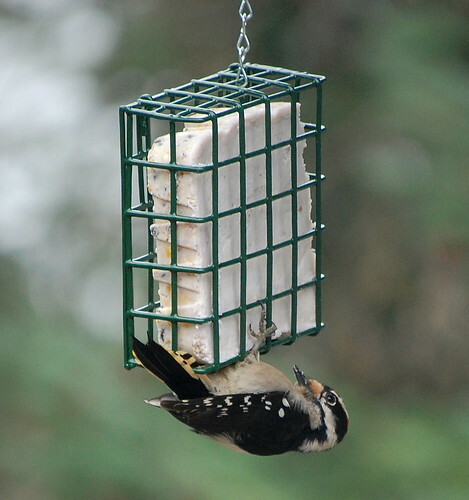 Isn’t it interesting that both woodpeckers are hanging upside down. I like the chickadees the best. 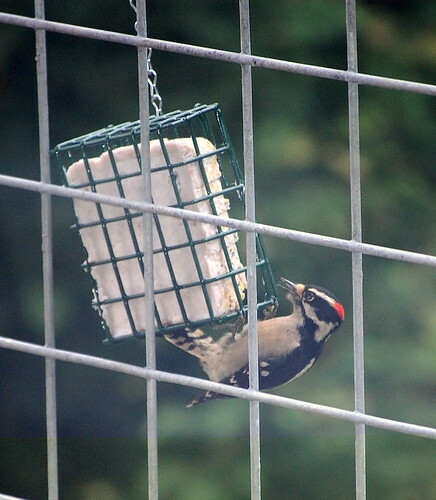 Church Lady — I’ve never seen a woodpecker eat at a suet feeder anyway but upside down. I don’t know why they do so! Quilly I loved the pictures. Thanks because now you have identified the wood pecker that pecks at my birch trees. It’s the exact same kind of wood pecker looks a lot like him too. I want to put out a bird feeder in the birch tree I just am not tall enough and terrified of ladders so I have to get hubby to put one up for me. I have left over bird food from my girl scout troop. The girls made a recycled bird house. There is another woodpecker that looks almost like this. It is just a bit bigger in size. that feeder is only about 5 inches across. This is a little bird. 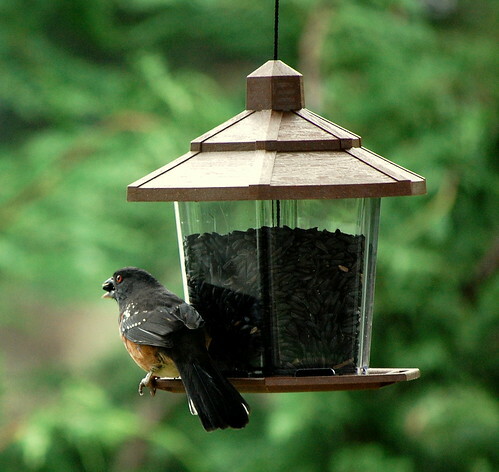 And, why does the bird feeder have to go so high you can’t reach it? The birds will come down to the food. Hang it on a lower branch. What wonderful visitors and gorgeous photos. I am jealous in the extreme both of the visitors and the photos. We had over 8 inches of snow over the weekend and the birds seem to have been eating more food than usual. I had to run out and get a huge bag of bird food this morning. I love watching them. I have to put the bird feeder on the other side of my fence to keep my dogs away from the birds. We feed the birds too and the squirrels. Actually, the bunnies seem to enjoy the seeds that fall on the ground as well, and we’ve even had deer help themselves! They are fun to watch but I have to say, you’ve gotten much better photos than I ever have.